The Hotel Rosy, 2 stars of Igea Marina , has a family atmosphere of pleasant common areas. It offers its guests: private parking, WI-FI in public areas, a large bar with TV, a playground area for children. Accepts small pets. 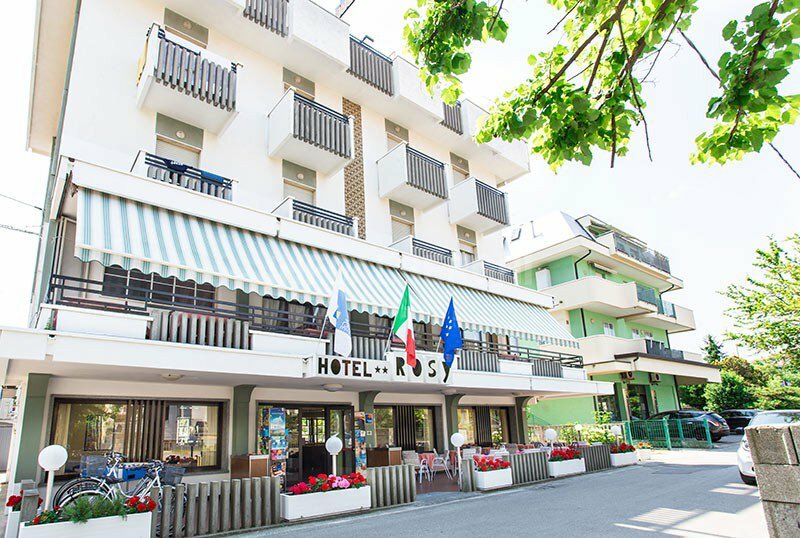 Hotel Rosy is located near the beach and a short distance from the pedestrian promenade of Igea Marina, a quiet town north of Rimini. The theme park of Italia in Miniatura is only 10 minutes by car, Mirabilandia Park and Zoo Safari just 25 minutes, while the other theme parks of Rimini such as Aquafan, Mirabilandia and Fiabilandia are just under 30 minutes. The rooms have a balcony, a private bathroom with an open floor shower and a hairdryer, air conditioning (only in some rooms), ceiling ventilation in the hottest rooms, digital terrestrial LCD TV, daily cleaning, breakfast in the room for a fee. The property features a garden, a open-air porch, a terrace, a sun terrace, a lift, a reading room with newspapers, free bicycles, and a laundry service for a fee. Theme nights are organized. AIR CONDITIONING: in some rooms. CONVENTIONS: beach, amusement parks, discos, spas, waterslide, Inail / Inps conventions and law enforcement agencies. Shuttle service for a fee. PETS: pets are allowed small size, not in the common areas, must be notified at the time of booking and may have an additional cost. BREAKFAST: sweet and savory buffet with a wide selection. LUNCH AND DINNER: 2 choice menu, meat and fish. Pasta and desserts are homemade. In hotel: strollers, mini / junior club, entertainment, indoor and outdoor playground area, baby sitter on request and for a fee. The hotel has an agreement with the bathing establishments: Bagno 57, Bagno 58 with playground area and entertainment for children, sunbeds and beach umbrella, relaxation areas for adults. Prices shown are per day per person for a minimum of 7 nights. - To confirm the reservation, a deposit of 30% of the total amount is required. Book your stay of at least 5 nights in the period between April 4 and June 9 and with only € 20 per night per person you will receive all the services included in the Village Formula.